It’s time once again to post the latest revision of my unofficial list of the moths of Plainsboro Township. This fifth edition lists 393 species, which is a considerable jump over the fourth edition’s total of 344 species. 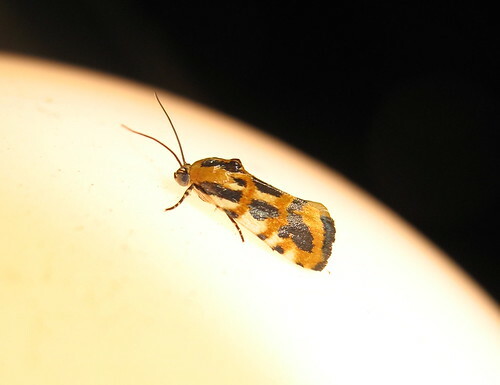 Although new species are added every year, the large number of new species in 2016 can be ascribed to four nights of mothing at Plainsboro Preserve from late June to late July. Even though our setup did not include a mercury vapor lamp, we ended up with a total list of 128 species identified during the month or so that we ran this informal survey. There were also 16 different species complexes (i.e., moths that could only be identified to genus or to species pair), as well as an assortment of yet-unidentified moths. A total of 64 species and 6 species complexes were new for Plainsboro Preserve. June 25 and July 27 ended up being our biggest nights; those also happened to be the nights we stayed out later, which probably has something to do with it. All in all, running our own sheet setup was an interesting and educational experience. Thanks to New Jersey Audubon’s Plainsboro Preserve for allowing us the opportunity. We have just turned over to a new year, so that means it’s time to compile the past year’s updates and upload a new version of the Plainsboro moths checklist. This is the fourth (!) edition and it is still likely a very partial listing of what’s out there. One of the more exciting additions to the list was the Common Spragueia (Spragueia leo) that illustrates this post. It was waiting for me after I got home from a moth night at Batsto in August. The grand total of species now stands at 344. There are also some additional month records for previously recorded species. The list can be found here. Happy mothing in 2016! When I stepped out the front door on Christmas morning, I found a moth perched on the doorframe. It was gray, with wavy lines across its wings, and some swaths of brown along the lines. It was definitely an Iridopsis moth and, given the month, most likely a Brown-shaded Gray (I. defectaria), a moth that flies earlier and later in the season than other Iridopsis moths. The winter has been unseasonably warm so far, so seeing one of the early/late season moths in December was not unexpected, though the fact that it showed up on Christmas morning was a pleasant surprise. I returned home on New Year’s Day and the same moth was still sitting in more or less the same place. It stayed there for several more days. I thought about poking it to see if it was still alive, but I didn’t want to disturb it. One day, when I was going through the door, it twitched a little bit, so that was confirmation that it was still alive. Finally, when I went out on January 10th, the moth was absent. I didn’t find any trace of its body on the ground or in a spiderweb, and the previous night had been warm, so I like to believe it left on its own, having found a sheltered place to roost for 16 days. There’s no way to know for sure, and it will remain one of those little mysteries of natural history. The episode reminded me of the Roman god Janus, the double-faced patron of beginnings and endings. 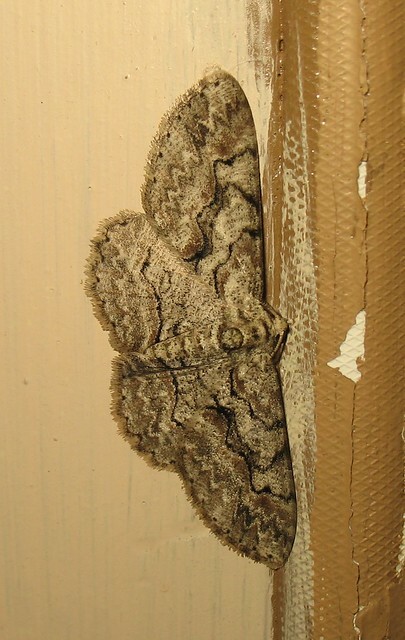 The Janus moth crossed from the old year into the new roosting on a doorframe; doors also happen to be associated with Janus. The moth, of course, was just living its life with no knowledge of the associations it happened to evoke in the mind of a human observer. It was alive and active during a warm early winter and was attracted by lights to a location that proved to be a relatively good place to roost for a few days. Then it moved on. 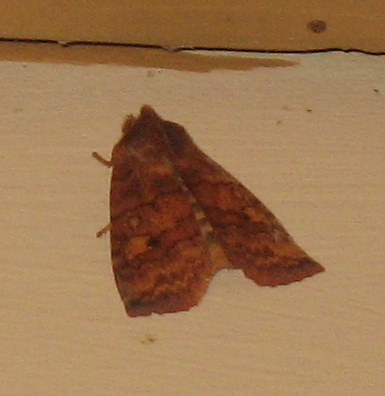 So that was the first moth of the year, as well as the last moth of the previous year. Eupsilias are robust Noctuids that overwinter as adults and are sometimes active during warm spells during the winter. There are seven Eupsilia species in the east, five of which sport a white or orange reniform spot flanked by two tiny dots, one on each side. This marking resembles Jupiter flanked by its moons when seen through a pair of binoculars. The mark is very distinctive, and readily narrows identification down to five species. Once the identification is narrowed down to this species group, however, things become much more difficult. 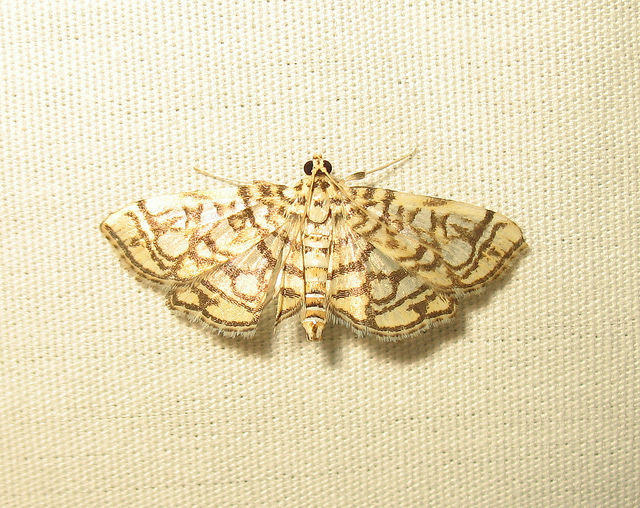 Many moth-ers refer to moths with this mark as Straight-toothed Sallows (E. vinulenta) and leave it at that, but most of these species cannot be distinguished from each other by photographs and are best referred to as Eupsilia sp. or Straight-toothed Sallow types. 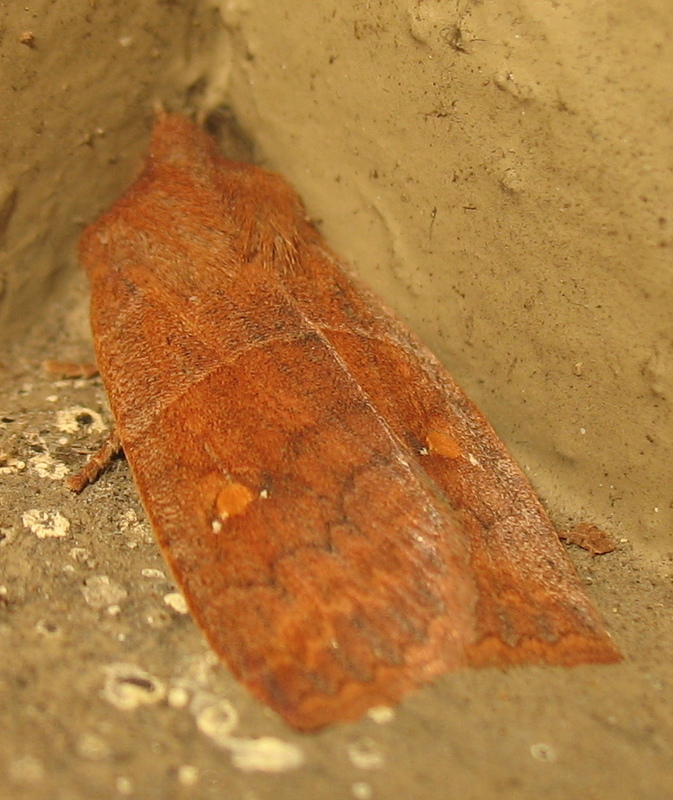 The exception is the Three-spotted Sallow (E. tristigmata), which has a noticeable orange orbicular spot and a dark spot in the inner part of the reniform spot. Straight-toothed Sallow can be distinguished from its close relatives by details of forewing scale structure. The forewing scales end with straight (not curled) teeth. This may be visible under high magnification; see, for example, this photo from BugGuide and compare it with a similar photo of Franclemont’s Sallow (E. cirripalea), which shows curly scales like strands of hair. According to Wagner et al. in Owlet Caterpillars of Eastern North America, Straight-toothed and Three-spotted Sallow are found throughout New Jersey. An undescribed yet common species is mainly found in northern Jersey, while Franclemont’s Sallow replaces the undescribed species in the southern part of the state. Sidus or Barrens Sallow (E. sidus) is most likely to be found in barrens habitats and is at best local elsewhere. I have found Eupsilia sp. moths from November through March, with most records coming from either of those months (March has a slight edge). Wagner et al. state that Sidus Sallow flies later in the season (sometimes into May) than its relatives. February was more of the same as January, which is to say, no moths. The closest I came was spotting a small fluttering insect early in the month as I was driving after dark, but nothing showed up at the doorstep. Constant winter storms and bitter cold will do that. Just for curiosity, I looked at previous years to see if there was any other year that had a mothless January and February. The first full year that I photographed moths was 2007. This year, 2015, was the first year since then that has lacked moths at the beginning of March (I’m not counting Webbing Clothes Moth in any of this, but I haven’t seen any of them yet this year, either). 2007 JAN: Green Cloverworm Moth Hypena scabra. FEB: none. 2008 JAN: Bicolored Sallow Sunira bicolorago, Eupsilia sp. FEB: none. 2009 JAN: none. FEB: Eupsilia sp. 2010 JAN: possible Agonopterix sp. FEB: none. 2011 JAN: none. FEB: Eupsilia sp. 2012 JAN: Eupsilia sp., Spring Cankerworm Moth Paleacrita vernata. FEB: Eupsilia sp., Spring Cankerworm Moth Paleacrita vernata, The Half-wing Phigalia titea, Toothed Phigalia Phigalia denticulata. 2013 JAN: Green Cloverworm Moth Hypena scabra. FEB: Green Cloverworm Moth Hypena scabra, Spring Cankerworm Moth Paleacrita vernata. 2014 JAN: none. FEB: nondescript brown Tortricid. 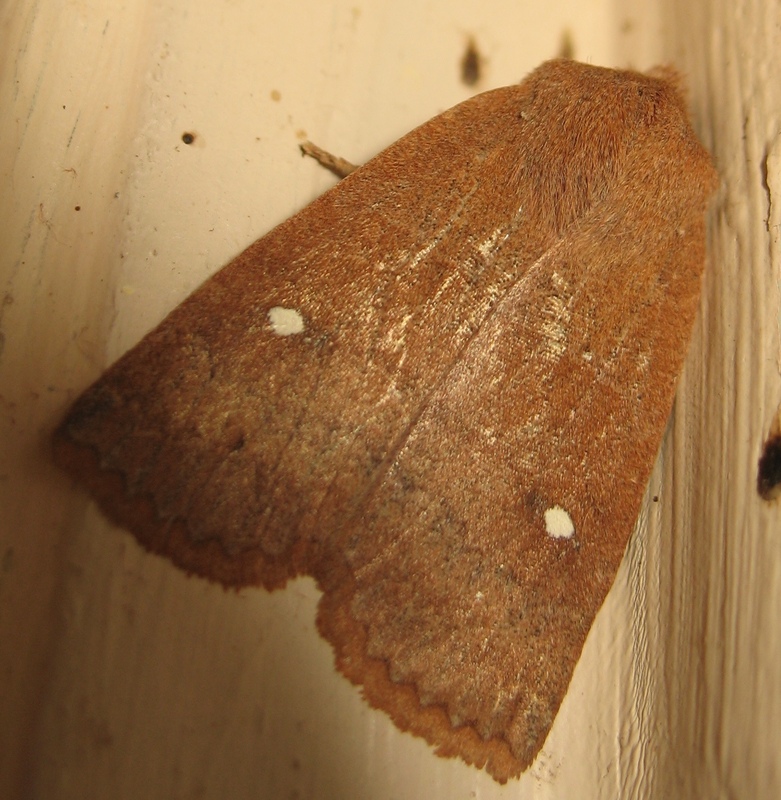 The beginning of 2012 was rather mild, so the moth season got off to a fast start that year. The milder temperatures predicted for next week may finally get things stirring. I’ve updated and revised my list of Plainsboro’s moths. The third edition of the document can be found here. The total number of species now stands at 329, which is surely a small fraction of the moths that can be found in the township. A brand new year of mothing has started, but so far, it’s been a bust. I haven’t even seen any Webbing Clothes Moths indoors, let alone any of the outdoor moths. In past Januarys, I’ve seen Green Cloverworm Moth (which can overwinter as an adult) and Spring Cankerworm Moth (one of the early spring moths that will emerge early if there is a mild winter). This year, doubtless due to the nasty weather and frequent cold spells, there’s been no moth activity. Maybe things will improve in February.